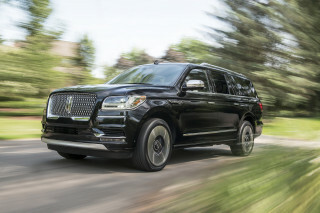 The Escalade-Navigator wars are in full-force, and we tend to side with Lincoln’s reborn flagship for its stunning design and luxurious interior. 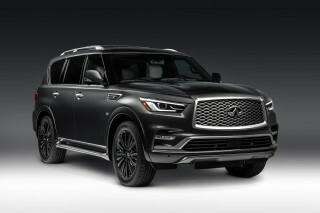 The Infiniti QX80 surprises with its good value and supremely comfortable interior. 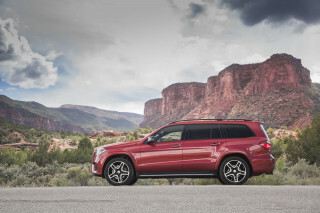 As an S-Class on stilts, the Mercedes-Benz GLS lacks for little and can be ordered with a bonkers AMG V-8. 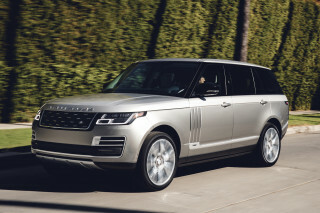 Though its price jumps well into six figures, the Land Rover Range Rover sets the standard and feels worth every bit of its substantial cost. Finally, the Lexus LX 570 hides its Toyota Land Cruiser roots well and offers more off-road ability than its rivals, if that matters. The 2019 Cadillac Escalade is a full-size luxury SUV that feels like it’s stuck in time, at least up against its fresher, more modern rivals. The 2019 Escalade doesn’t disguise its Chevy Tahoe and Suburban roots as well as it should for a price that can climb to six figures. The Escalade still gives passengers competitive technology, a lavish interior, and a smooth ride. The Escalade dips into GM's V-8 family for power. its 6.2-liter V-8 churns out an impressive 420 horsepower and 460 pound-feet of torque. The Escalade has rear-wheel drive, but all-wheel drive is an option. A 10-speed automatic designed by General Motors and Ford handles the shifts in the Escalade SUVs, just as it does in the rival the Lincoln Navigator. Predictably, the Escalade is a fuel-guzzler and it’s a shame that no hybrid version exists any longer. Standard magnetic shocks disguise the Escalade’s truck-based architecture, at least to a degree. It lacks the twisty road composure of more sophisticated rivals such as the Mercedes-Benz GLS-Class and Land Rover Range Rover, but the Escalade makes a confident trailer-hauling vehicle and soaks up bad pavement with poise. Inside, the Escalade’s truckiness results in some compromises such as a tall cargo area floor and less rear-seat leg room than its exterior dimensions might suggest. Still, Cadillac’s flagship piles on luxury and comfort as well as ever. The 2019 Cadillac Escalade is brash but refined. The 2019 Escalade and its 20-inch-longer Escalade ESV sibling share a profile and most of their underpinnings with the comparatively plebeian Chevy Tahoe and Suburban, but the difference is in the details. Chrome won’t get you home, but it’ll probably get valets to park your Escalade up front. All but the base Escalade have big 22-inch alloy wheels that fit their demeanor. Just be prepared to spend on replacement tires. Inside, the Escalade has less in common with its Chevy and GMC siblings and more with Cadillac sedans. Most of its switches are capacitive, a trendy look that’s not always terribly functional. The standard leather upholstery on most trims feels good enough, but the range-topping Platinum wraps the seats, dash, and door panels in dressy semi-aniline hides offset by stunning real wood trim. The Escalade’s basic design might not scream upscale, but its finishes are top-notch. Muscle-truck acceleration and a surprisingly good ride make the 2019 Cadillac Escalade a proper luxury SUV. All Escalades use a 6.2-liter V-8 engine rated at 420 horsepower and 460 pound-feet of torque, substantial numbers that help offset its hefty 5,600-pound curb weight. The V-8’s prodigious power output endows it with excellent acceleration from a stop and good passing power. That engine is aided by a quick and usually smooth-shifting 10-speed automatic transmission. In certain situations, the transmission can find itself in the wrong gear, but it usually corrects itself quickly. The standard magnetic dampers quell road imperfections with aplomb despite the big wheels and short tire sidewalls and make the Escalade more comfortable through sweeping highway curves compared to its mainstream-brand siblings. Quick, well-weighted steering helps, although there’s no escaping the reality of its tall design when it comes to a winding byway. Strong brakes bring things to a halt with considerable nose-dive. Underneath its flashy body, the Escalade features throwback body-on-frame construction with a simple live axle at the rear that endows it with a truckier feel than high-tech rivals such as the Mercedes-Benz GLS-Class. That simple design pairs well with the Escalade’s V-8 engine to provide it with ample towing capacity—as high as 8,300 pounds—and a confident feel with a trailer attached. Rear-wheel drive is standard and should be just fine for most sun-belters. The Escalade’s optional all-wheel-drive system requires no driver intervention but lacks the low range that’s useful for lugging boats out of a lake, for instance. Notably, the 22-inch alloy wheels on most Escalades can be expensive to replace. Big on the outside, not quite as massive on the inside, the 2019 Cadillac Escalade pampers with old-school luxury. Up front, the 12-way power thrones on most Escalades are wrapped in soft leather and provide supreme comfort. The 18-way power-adjustable seats with built-in massagers on the Escalade Platinum are divine, and that’s before we even talk about the extra-soft semi-aniline leather that wraps almost every surface. Rear-seat riders have good space in the Escalade ESV, but the standard Escalade has less leg room than its garage-filling dimensions might suggest. All Escalades include a power-folding third row of seats that can hold two adults or three children in decent comfort. Behind the third row, the standard Escalade offers 15.2 cubic-feet of cargo volume, while the ESV can swallow a week’s worth of luggage to the tune of 39.3 cubes. Fold the second and third rows and the Escalade ESV rivals a San Francisco apartment with its nearly 121 cubic-foot capacity. Worth special mention is the Escalade Platinum that marries softer leather on the seats, dashboard, door panels, and center console with a suede-like headliner, and exotic wood trim for a truly special feel inside. The Cadillac Escalade earned worrying four-star rating from the feds and its limited roster of standard safety gear is another concern. The 2019 Escalade checks all the typical boxes for its standard safety gear: six airbags, stability control, and a rearview camera. Low-speed automatic emergency braking, active lane control, and blind-spot monitors come on the Escalade Luxury trim but aren’t available on the base model. Full-speed automatic emergency braking and adaptive cruise control require stepping up to the Escalade Premium Luxury. Nearly all rivals include this gear as standard equipment. In the federal government’s crash testing, the Escalade’s biggest demerit is its three-star rating for rollover, an unusual score that serves as a reminder of its truck-based platform. The 2019 Cadillac Escalade wants for little, at least once a few options are selected. The base Escalade comes with 12-way power front seats, leather upholstery, an 8.0-inch touchscreen for infotainment with Apple CarPlay and Android Auto capability, and a 16-speaker Bose audio system. We’d bypass it in favor of the Luxury trim, however, which adds low-speed automatic emergency braking, active lane control, and blind-spot monitors, plus 22-inch alloy wheels that suit its bling style better than the standard 20s. The Premium Luxury trim adds full-speed automatic emergency braking, adaptive cruise control, and a rear-seat Blu-ray entertainment system. But once you’re at that level, you might as well step up to the Escalade Platinum for its divine semi-aniline leather upholstery, massaging front seats, and real wood trim. All in, an Escalade ESV Platinum with all-wheel drive crests six figures—and it mostly feels worth its weight in steel, wood, and leather. The 2019 Cadillac Escalade is among the thirstiest vehicles we review. It could be worse, but it could also be better. 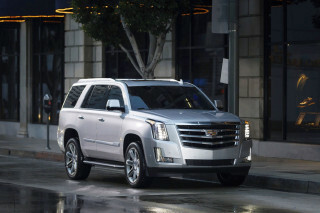 With standard rear-wheel drive, the Escalade earns 14 mpg city, 23 highway, 17 combined. Opting for all-wheel drive bumps that down to 14/21/17 mpg. Regardless of drive wheels, the Escalade requires pricey premium unleaded gasoline. 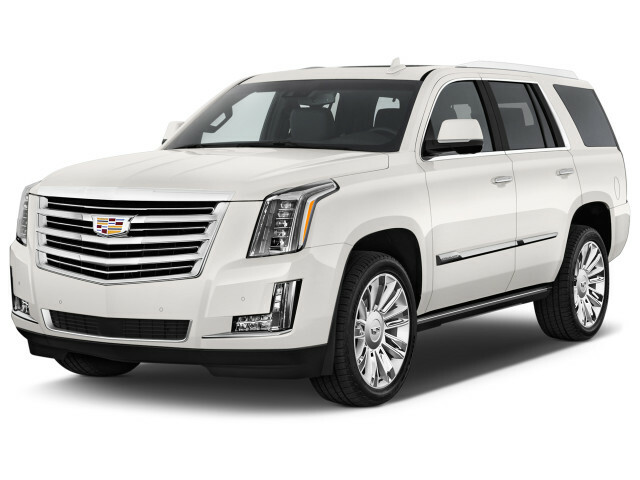 No hybrid Escalade exists any longer, either.